Although it was in the field of opera that Handel had first made his mark when arriving in London in the early 18th Century, the high costs of producing operas made it an uncertain one. By the 1730s Handel therefore began to explore other possibilities. It is in this context that the Concerti grossi Op. 6 may be seen. Composed during a few hectic weeks in the autumn of 1739, the set was partly intended by Handel – renowned mainly as a writer for singers and as an organist – to reinforce his stature as an instrumental composer. 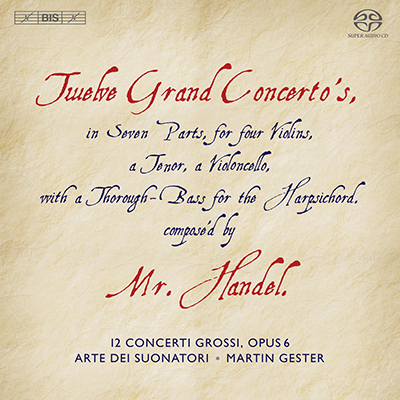 It would seem to have been a success: even before publication, Twelve Grand Concerto’s compos’d by Mr. Handel – as they were advertised in the press – had been sold in 122 copies to 100 subscribers, including Handel’s royal pupils, the princesses Anne, Amelia, Caroline, Mary and Louisa, as well as their brother, the Duke of Cumberland. 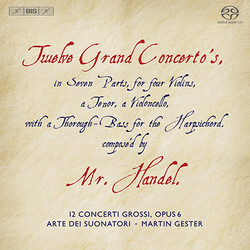 In choosing to publish the concerti in a set of twelve, and adopting the set-up of a concertino group of two violins and one cello, contrasting with the tutti ensemble, Handel followed the tradition established by Arcangelo Corelli, whose hugely influential set of Concerti grossi Op. 6 had been published in 1714. What Handel added to the Corellian concerto was a distinctly dramatic quality – not surprisingly for the great operatic composer – as well as elements of the French-German suite tradition – in keeping with his own origins. The result is music that exhibits a great variety of musical thought and invention, here interpreted by the highly acclaimed Polish ensemble Arte dei Suonatori making their third recording for BIS. The recordings are the fruit of a regular collaboration between the ensemble and French conductor Martin Gester, focussing on the baroque concerto.